Everyone in the family gets matching pajamas for Christmas Eve. It doesn't matter if you are 6 months old or 60 years old, the tradition continues every year. You may feel silly or sheepish, but when the time comes, everyone has to participate. We tend to hide these pictures in strict confidence, but I will include a picture (just don't tell the family!) It is a great fun family tradition that brings the family closer and makes the holidays even more enjoyable! Check out MyahandMe.com for SUPER cute matching family clothing! 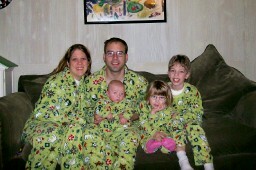 Check out the matching family pajamas at www.FootstepsClothing.com . These matching Christmas PJs are adorable and fun! I found a great site with a whole boat load of matching pajamas that are cute and really affordable. Every family should do this to their kids!